This​ ​post​ ​was​ ​sponsored​ ​by​ ​Evite​ ​in​ ​collaboration​ ​with​ ​7UP® and​ ​NABISCO®.​ ​All​ ​thoughts​ ​and​ ​opinions​ ​are​ ​my​ ​own. Last month, I flew to LA for a really fun project with Evite for the holidays, and I can finally share what I was working on today! 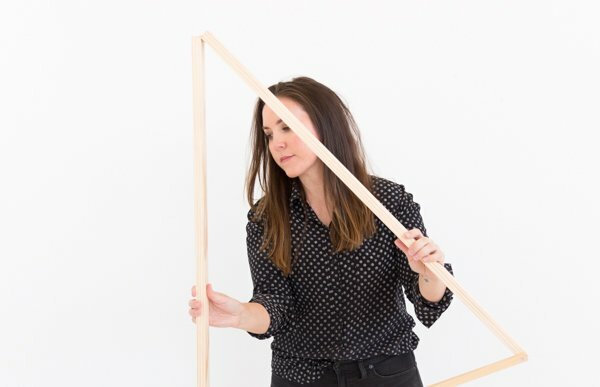 I made over a completely blank white space on a tight budget of $500 for Evite’s Tiny Party Challenge, and squared off against another blogger. Fun stuff, right?! The before and after transformation was pretty drastic on this one. I even mixed my own custom paint color for the walls. Yes, I can be a bit extra when it comes to paint related projects. Ha! 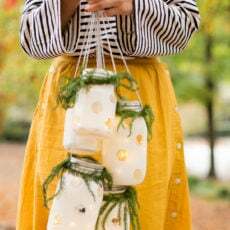 Be sure to click through for the full reveal, video, budget breakdown, and (of course) all the DIYs. But before you do, could you head over here real quick and vote for my party?! 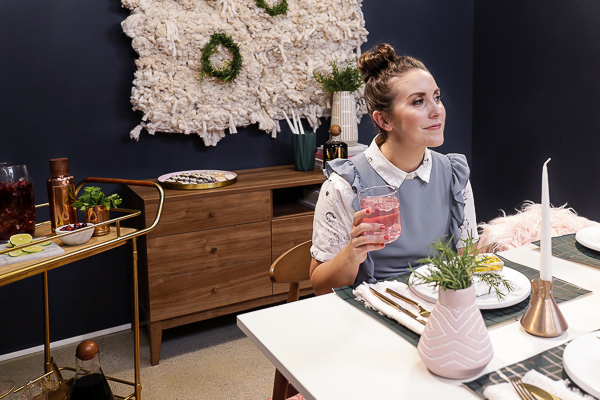 One lucky voter will win a $500 Target GiftCard™ to create her (or his) own tiny party for the holidays! The theme for my tiny party was Glitter and Gold. And while you’ll see subtle touches of both of those things throughout, I was most inspired by the different textures of the two. Gold having a slick metallic feel and glitter having a more gritty, tactile texture. So I played up those contrasts throughout the space. 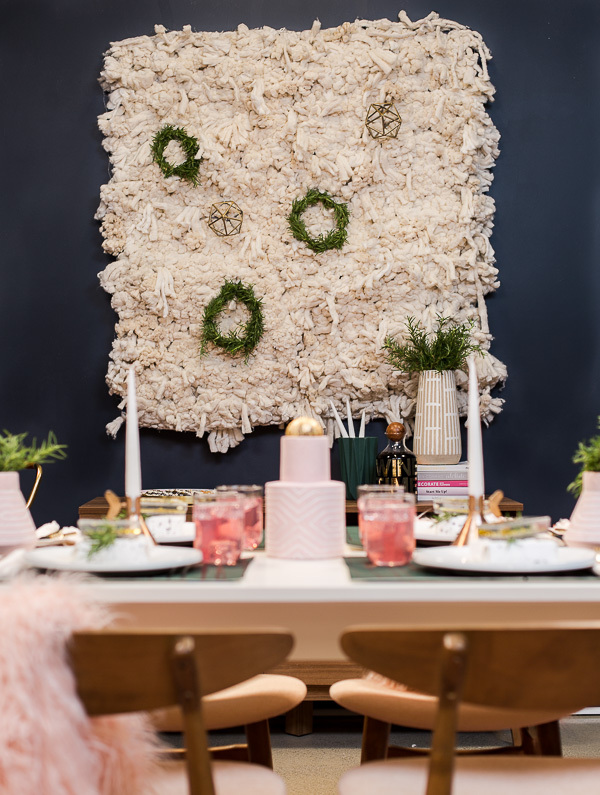 I love cozy party settings, especially during the holidays, so I brought in a few soft textures that guests would want to cuddle up to – like the pink faux fur blankets and the woven DIY art piece. Naturally, there were quite a few DIY ideas in the mix – I even created my own paint color! Check out the video to see how I brought everything to life and the full budget breakdown. And then vote for me here for a chance to win $500 for your own tiny party! Food and Drinks are crucial to any good party, right? 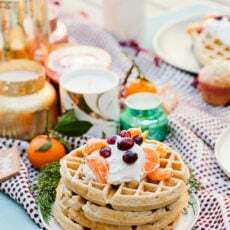 So, I have two holiday-centric recipes to share – a cocktail and a cheeky appetizer that serves as a yummy conversation starter (reminds me of when I was a kid too). Combine all ingredients in a large pitcher; gently stir. Chill for 20 minutes in refrigerator before serving. Serve garnished with frozen cranberries and a mint leaf. Dip crackers, 1 at a time, into candy coating, turning to evenly coat both sides of each cracker. Place in single layer on waxed paper-covered baking sheet. Refrigerate until firm. Spoon remaining melted candy coating into pastry bag fitted with small writing tip. Reserve for later use. Dip half of 1 cracker into melted chocolate, then turn to dip other half of cracker into chocolate, leaving white “v”-shaped wedge in center as shown in photo. Return to baking sheet. Repeat with 17 of the remaining crackers. Use toothpick or small clean paint brush to add buttons and bow ties to resemble tuxedos as shown in photo. Refrigerate until firm. Meanwhile, pipe remaining candy coating into a “v”-shape on remaining crackers to resemble gowns as shown in photo. Add decorations as desired. Refrigerate until firm. I knew I wanted a dramatic before and after, inspired by the drama of my theme, glitter and gold. But couldn’t find the exact paint color I was looking for when I went shopping for everything. So I decided to make my own paint color (!!!) by mixing 3 paint colors together to form one new one. I dubbed the new color Brittni’s dusky blue. It’s a v deep blue – almost black. Paint is a really great budget-friendly way to transform space, whether it’s big or small. 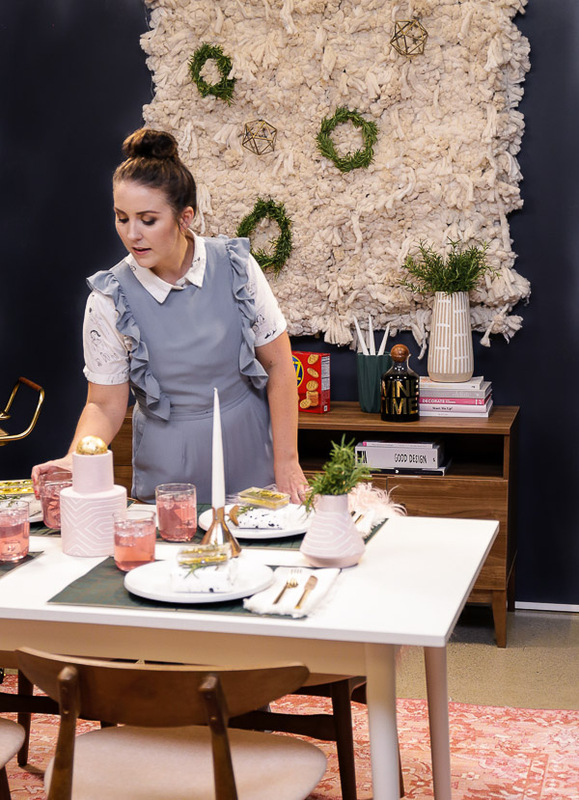 So, painting the walls felt like the perfect fit for my $500 tiny party makeover. Using super inexpensive rosemary plants (the ones that are potted have the most stems for the money), I cut the stems and wired them together a few bunches at a time. Then, I formed them into circles and wired the two ends together. They smell amazing and look cute and festive. You could even give them as party favors to guests when they’re on their way out. I hung my faux weaving DIY above the buffet (which is actually a tv stand that looks great as a sideboard) and then added some rosemary wreaths (DIY for those above) and geometric shapes. The weaving added a lot of cozy texture to the space and broke up the dark walls with something soft and high contrast. Bonus! This weaving doubles as a photo booth backdrop for guests. Anything that can pull double duty is great for tiny spaces. What’s a party without invitations?! Evite created a custom invitation for me, based on my room design. It was inspired by the hand lettered glitter cubes on the tabletop and my DIY rosemary wreaths. Cori and I made windowpane placemats from thick artist paper (I always use Rives BFK paper for this type of thing) – painted the paper an emerald green color, then used a black paint pen to freehand the windowpane lines. Then, I just cut them down to a standard placemat size (12×18). Four placemats cost $6 total to make. We also made our own wrapping paper, using thick artist paper and slightly watered down acrylic paint. Just fling it around on a paint brush and wait for the paint to dry before wrapping your presents. Take it further by adding a gold sticker to each present that has the first initial of each guests name to double as a place card setting. 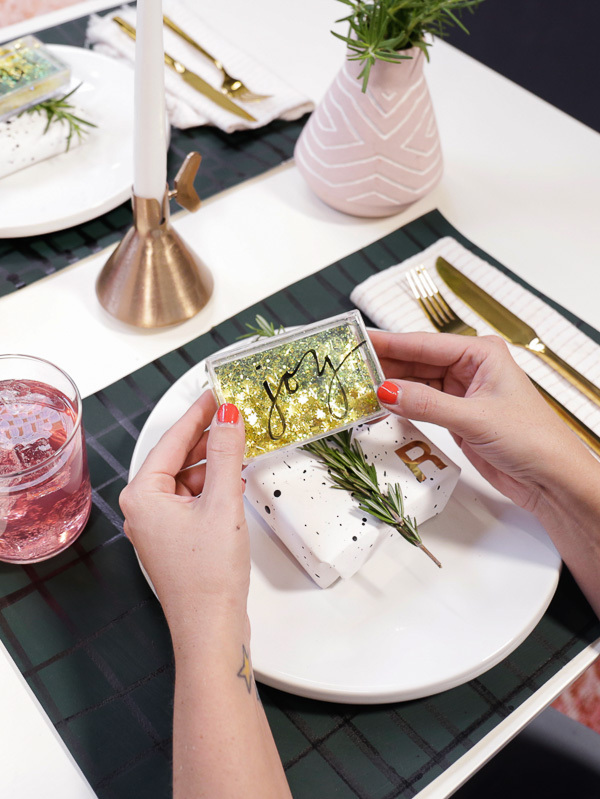 Then, top it with a sprig of rosemary and a glitter photo cube, like the ones that Cori hand lettered with the word JOY. Want to throw your own tiny party? 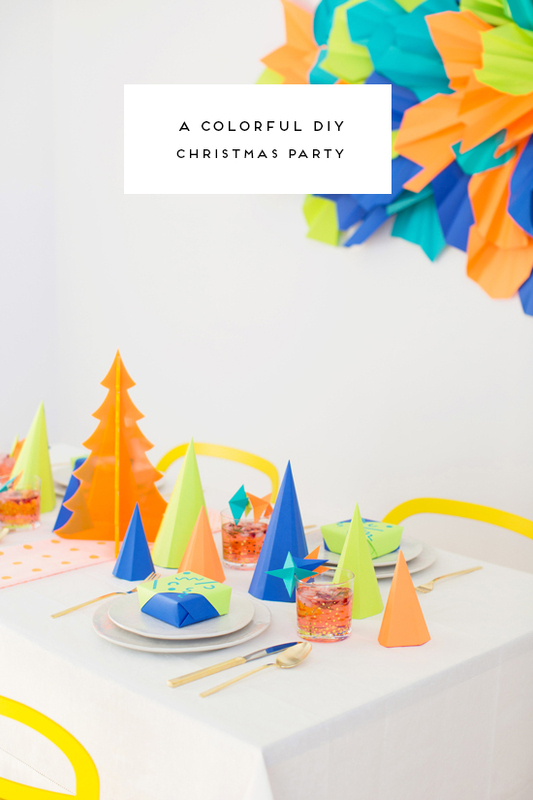 Head over to Evite to vote for my party AND you’ll be entered to win a $500 Target gift card to create your own tiny party for the holidays! I love the setup. It turned out really good. What a fun video and opportunity! Good luck! Thanks Antonella. It was a fun little adventure. Voted! 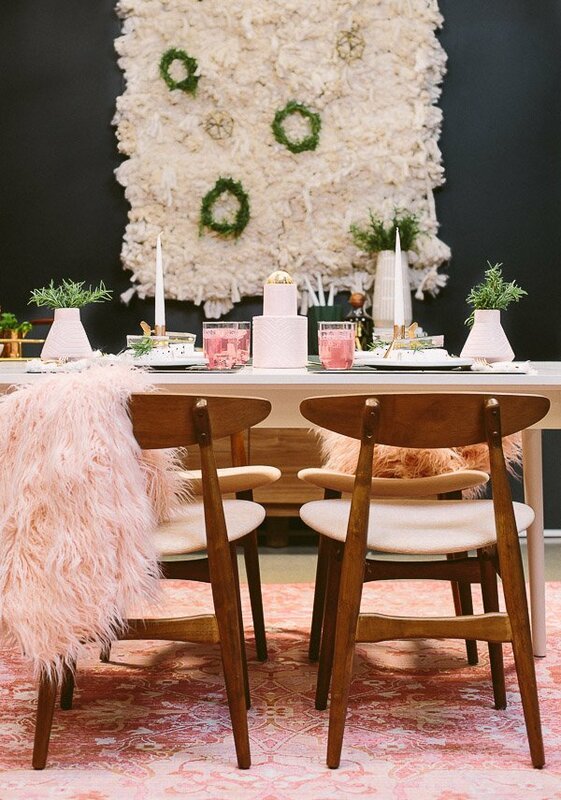 Love that paint color, Brittni, especially paired with the blush and green. 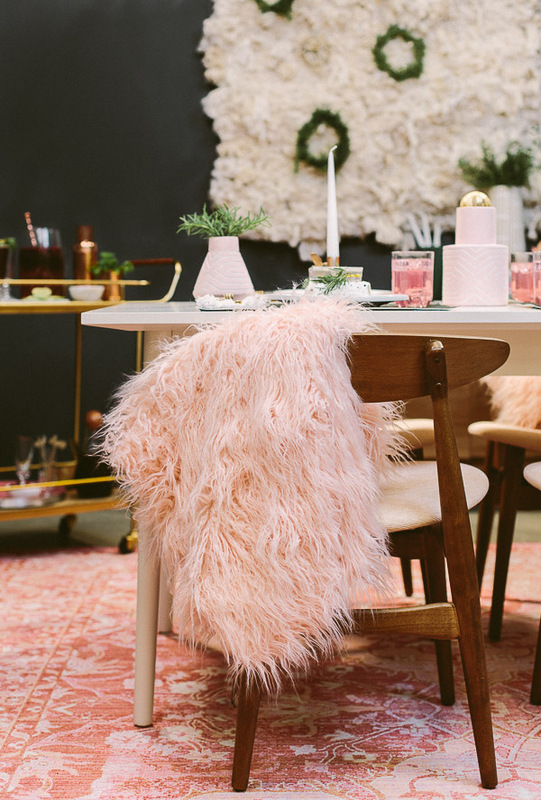 I love a sophisticated vibe that doesn’t scream “CHRISTMAS” with the color scheme. Thanks so much Kimberly. I appreciate it! Love how you decorated everything, that wall display looks so extraordinary I think! Hello Brittni, I love your dress up. It turned out really good. I like all your photos. You have shared such a nice tips with nice photography. Thanks and keep posting with us.